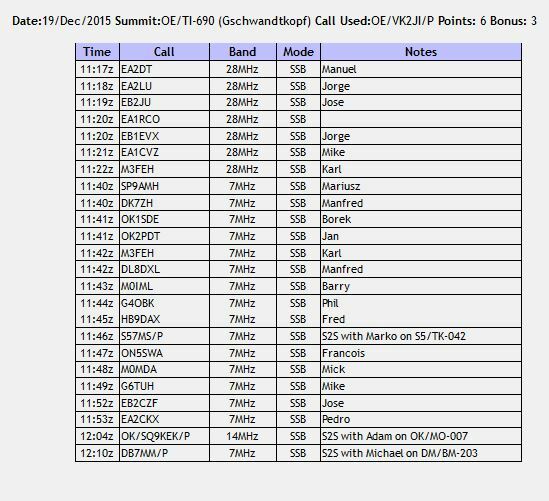 OE/VK2JI/P – December 19th. 2015 – OE/TI-690 Gschwandkopf. Still looking for points in the 10m/6m SOTA challenge, I wanted to get out and add some six metre activator points to my score. Living in Germany I am not allowed to operate portable on 6 metres so a trip into another country is needed to make this happen. After activating Hohe Salve a couple of weeks earlier, I didn’t want to have such a long drive this time and so looked at the summits around Seefeld in Tirol. I found the six point, plus 3 winter bonus activator points Gschwandkopf (OE/TI-690) with its 4 seat, seat lift direct to the summit. As with many lifts in the alpine regions this lift had been out of service for maintenance and on the web site it simply said back in operation sometime early in December. Looking at the webcam on Thursday it was obvious it was not yet back in service. I sent an email on Friday asking when it would be back in service to get a reply saying they had just started service again that day. So the plan was set down to Seefeld the following day and up Gschwandkopf. I then heard that two CMEs were heading earthwards and could mess up propagation but how often have these not arrived or not had any effect? So I decided still to go and hope for the best. Rather than risk taking the repaired but untested six metre lightweight beam I decided to make do with the Spiderbeam Aerial-51 UL-404 off centre fed wire dipole that I would be using for 10, 20 & 40m in any case. While it wont give any gain on 50MHz it is defined as working on six meters. So I would in fact be using the reliable kit that I had used on many activations before. The “two bag configuration”. Gschwandkopf located above Seefeld which is about 10 minutes drive from the German/Austrian border on the road from Garmisch Partenkirchen to Innsbruck. Somewhat further than my usual German summits but not nearly as far as Hohe Salve. In Seefeld itself the Gschwandkopf lift is signposted but not at every turn, so it was good that I had mapped out and written down the road names in my planning. I also have a printout of the roads through Seefeld but did not need that – the list of road names was sufficient to get me to the valley station of the lift in 1.75 hours from leaving home, exactly as Google Maps had predicted. Ticket prices are interesting on this lift – the cost to go up and down the lift was €17 with a €2 deposit on the re-usable electronic ticket. But the lift is also listed as requiring 4 points on a points card, so in principal, I should have been able to buy an 8 point card at €3 less than the simple ticket but I was then told that the points cards are only sold to those skiing, not to pedestrians. Once I got to the lift, there was a separate section for pedestrians who had to wait until the half / full hour before they could use the lift. This was because they had to slow the lift down to load and unload those not on skis. Once on the summit, there were two restaurants (only one open as the number of people skiing was not big) and a small hillock (the actual summit) which as well as some benches also had a transmitter building and mast from the Austrian Broadcasting company. While I thought twice as to whether I should set up so close to this station, it caused me no interference and this is a lovely spot with some great views. I could see this being a good site for a 2m FM repeater or some 2m SOTA simplex contacts but I was here mainly for 6 meters not 2 meters, so I set all the usual gear up and started calling CQ on 50.140 and tried to self spot. I had especially taken out an Internet package on my Vodaphone SIM, but this refused to work in Austria, so I fell back to good old Deutsche Telekom (I have two SIMs in my phone) and sent the required SMS code to enable Internet connectivity and this time (not like on Hohe Salve) it worked. There was no free WiFi on this summit as there had been on Hohe Salve. I spent probably about 15 minutes on 6 metres calling and calling and calling, with not one response. SWR was fine, just propagation was not there. I then tried 10 meters and was happy to be able to get a total of seven contacts on 10 meters. The first 6 from Spain – good solid, easily readable signals. There seemed to be some propagation “tunnel” between me and Spain. The seventh 10m contact was with Karl M3FEH in Cornwall England and that was a difficult contact with very low signal strengths in both directions, but somehow we managed it. Thanks Karl. Once it seemed there were to be no more 10 meter contacts I saw some other activations were on 20m – of these about half I could not hear , two I called could not hear me but in the end I did manage three S2S contacts – two on 40m and one on 20 metres. 14 chaser contacts on 40 meters completed the log. After the last contact an S2S, I had to hurriedly pack up the station to be able to get to the lift to go down on the half hour – otherwise I would have to wait another half hour before I would be allowed on the lift. This is a very easy access summit. I was surprised initially while planning as to why so few people have activated it, until I saw it had only been added to SOTA in October 2015. I expect a lot of people will now include it in their holidays to Tirol and in Summer, I expect the lift will take pedestrians without a delay. The propagation on 6 metres was not there however there seemed to be a pipe on 10 metres into spain. Was the extra drive worth it – no I’m sure I would have been able to capture the 10m contacts from a German summit.